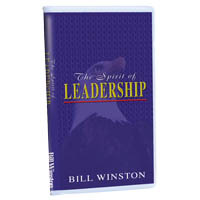 Bill Winston an "Anointed" man of God and full of integrity seeks to educate your "Spirit" man; the real, inner you. Through biblical examples and real-life situations, he shows that leadership develops in a person from within. God needs individuals with a sense of purpose, destiny, and vision who will earnestly seek after Him and put away selfish motives for a higher purpose. He's looking for those who are willing to develop God's character and integrity--two qualities vital to leadership. When godly principles are established in the heart, we can lead under God's anointing to the point of saving entire nations from harm and danger.